We are amazed at the sunshine we’ve been having lately after such a cloudy and cold, snowy November. It feels so uplifting to just walk around outside doing odds and ends chores. Will has been able to get a lot done — while I do the piddly jobs, he has been working on the big ones. He was finally able to go to the neighboring hayfield and bring home the last of the fifteen big round bales which were located on a low lying area of the field. With all the fall rain, it was just too wet to drive a tractor there, let alone carry off 1,500 pound bales of hay on the front end loader. Now the bales are safely home and we can breath a sigh of relief. I got another big package of boneless, skinless chicken breasts and half of a boneless pork loin canned up and have run out of room on the pantry shelves, even taking into consideration the shelves along the basement walls Will told me “were not meant for food.” As a couple who have both had very broke times and little food in the house, we both feel totally blessed to have all that wholesome, tasty food surrounding us! I finally finished a big puzzle I’ve been working on since just after Thanksgiving. It was a doozy! But last night, Will and I finally got the thing together. It was hard, but we did it, sometimes just one piece an hour. Now I can box it up and clear off the table for Christmas dinner. 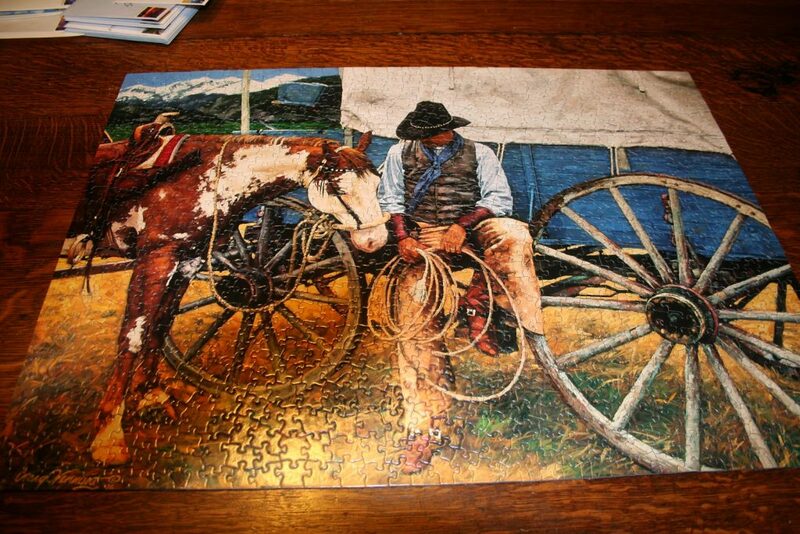 Take a look at the cowboy puzzle we just finished. Now I can reclaim our dining room table. My big pond goldfish and koi are doing very well in the 100-gallon fiberglass stock tank in the basement, where they’ll spend the winter. Here in Northern Minnesota, the ice in the fish pond freezes all the way to the bottom even though it is four feet deep. 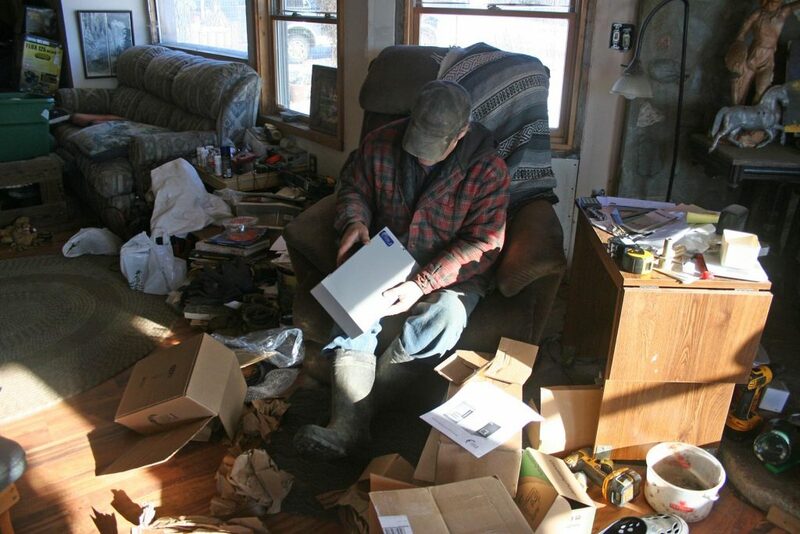 And living off grid like we do, there’s no way to run a heater to keep it ice free, even in part. I remember Grandma, in Detroit, keeping her goldfish from the pond in the back yard, in the basement. Grandma kept hers in wash tubs so I figured a much bigger tank would work just fine. I have it rigged so I can partially drain it and add new water, if necessary as there’s no filter. So far they seem very happy. 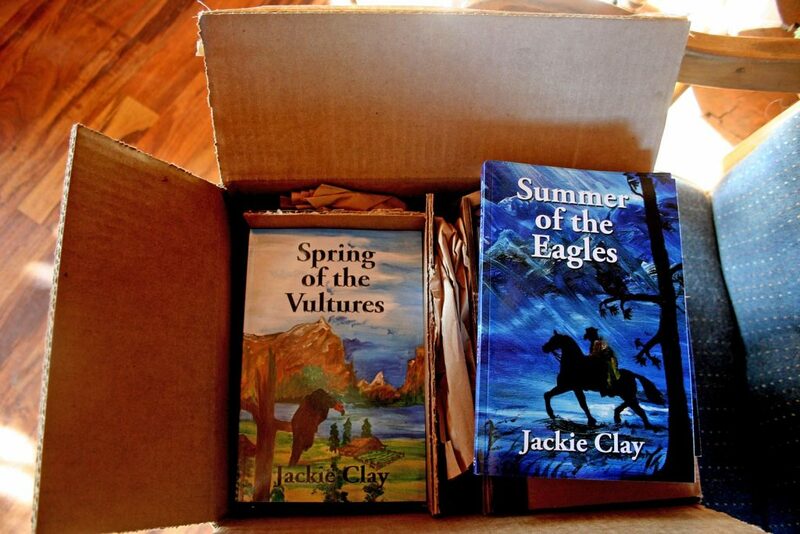 My Western novels also arrived today so I can pack up some for Christmas gifts folks have ordered. Will is inspecting the boxes that came today so he can finish up the solar array. Beautiful puzzle!! I love to work them but my cat is such a menace that I have given it up. Yeah, I know what you mean. Our cat, Mittens, been known to knock pieces off the table and then carry them off. More than one puzzle has a missing piece or two that I have to manufacture. Bad cat! Back when I was in college, daughter in high school, hubby teaching VocTech, the stress with finals and Christmas approaching at the same time was enormous. For some reason, I dumped a jigsaw puzzle on the dining room table in the middle of the chaos. I couldn’t believe the change in the atmosphere. We never had time to sit down to work it. But as we passed, we would stop to put a piece in here or there. It just seemed to calm things down. For years after, I would buy a Christmas themed puzzle the end of November. It became a tradition with my daughter and I. One year, we didn’t get it done in time for Christmas dinner. So we plopped the tablecloth on top of it and finished it later. Ha ha. That happened to us last Christmas! Nobody knew they were eating on top of an unfinished puzzle! We love having one out all the time, just as your family did. Like you say, whoever is passing by can’t resist stopping to find a piece or two. They are six volt golf cart batteries. WOW! That will be a major Merry Christmas for you both. We are having some fine weather here in SW Missouri, too…wonderful. Blessings for the holidays and the New Year. Oh yes it will! It’s amazing at how much you get done outside when the weather’s moderate, isn’t it? Merry Christmas to you and the best New Year!